Our blue plastic bottle collection is a favorite for spa and salon packaging. 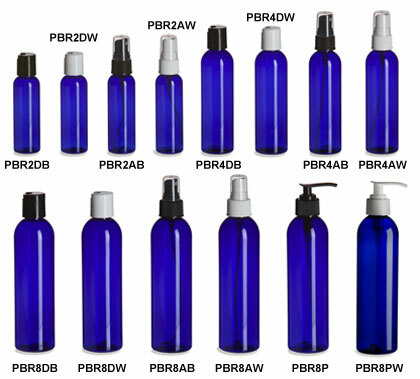 These brilliant blue bottles work for lotions, gels, scented sprays, or cleansers, with the added safety of shatterproof PET plastic. The bottles have a glass like finish that is easy to label and display. Choose from a wide variety of closures for an attractive finished product that meets your packaging needs. All prices include applicable closure.